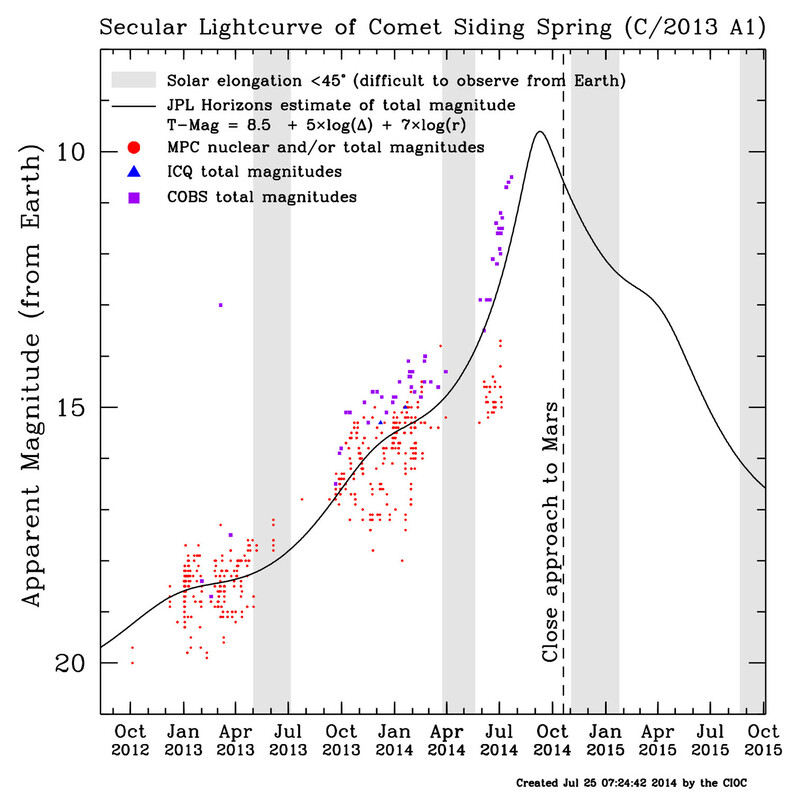 "No news is good news" - that's an old phrase, but it seems somewhat pertinent for C/2013 A1 (Siding Spring). The comet is currently trending very well compared to the predicted JPL curve and, if anything, it's actually over-performing somewhat. That is always a nice thing if you're in the business of watching comets! This was never going to be a hugely bright object, and we still maintain that it will be a tricky one to observe in October when it is very close to the much brighter Mars. However, it's behaving very nicely and as always we encourage astronomers to attempt observations and share those results with us. We see a report that Dennis Bodewits has obtained another set of Swift observations between July 8-10, 2014. He reports Q(H2O) = 6.1 +/- 0.4 x 10^27/s and notes that "Extrapolation to rh 1.5 AU, assuming Q ~ rh^2, yields a production rate of 1e28/s at Mars.". What does that mean? It means the comet is doing what comets do, and doing it in a reassuringly predictable manner. And if you're the owner/operator of a billion-dollar fleet of spacecraft orbiting Mars, predictability equals a good night's sleep when a big dust/ice spewing snowball is going to be passing through the neighborhood!